The first Spanish Grand Prix was held in 1913 and was run to touring car rules. It took place on a 300-kilometre road circuit at Guadarrama, near Madrid. There was also the Catalan Cup of 1908 and 1909 before that, on roads around Sitges, near Barcelona, marking the beginning of a long-standing racing tradition in Catalonia, which remains today. A permanent track known as Sitges-Terramar was the site of the 1923 Spanish Grand Prix. In 1926, the Spanish Grand Prix was held at Circuito Lasarte on the northern coast, home of the main race in Spain during the 1920s – the San Sebastián Grand Prix. 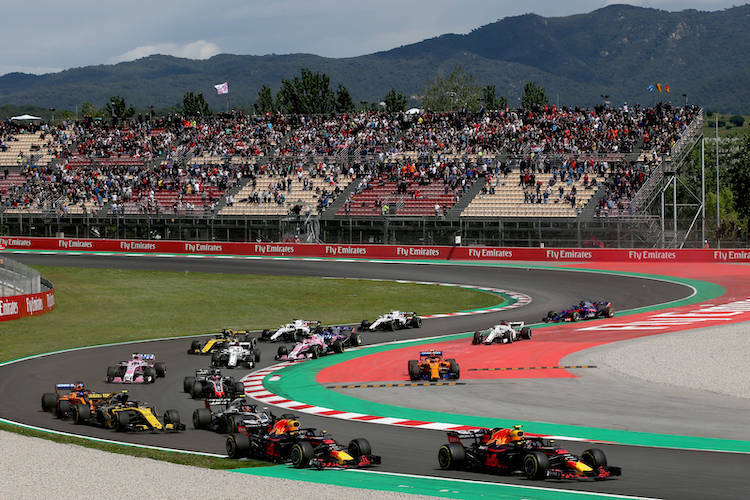 A year later, the Spanish Grand Prix was part of the AIACR World Manufacturers’ Championship, but the race was still not established in Formula 1 and was run to sports car regulations. In 1946 after the Civil War, racing returned to Spain at the Pedralbes Circuit in Barcelona for the Penya Rhin Grand Prix, but it wasn’t until 1951 that Spain joined the Formula One championship. In the 1960s the Royal Automobile Club of Spain commissioned a new circuit north of Madrid in Jarama, and Catalonia rebuilt their Barcelona circuit, making it much safer, in Montjuïc. From the Spanish Grand Prix in 1968 at Jarama, the race would then alternate between these two tracks. In 1985, the Mayor of Jerez commissioned a new racing circuit, the Circuito Permanente de Jerez. When Barcelona was awarded the 1992 Olympic Games a massive investment was made in infrastructure throughout the region. The Catalans were becoming rather powerful in the country and used the influx of funding to construct the Grand Prix circuit they had wanted for some time. Organisers spent two years building the track and used input from Spanish drivers to design the layout. The event moved to this new track in 1991, where it has remained since. The event the following year was advertised as the Grand Prix of the Olympic Games. As of 2013, the Spanish Grand Prix (Formula 1 Gran Premio De España) will alternate every year between the Circuit de Catalunya in Barcelona and the Valencia Street Circuit in Valencia, Spain. Germany’s driver Michael Schumacher has won the Spanish Grand Prix more times than any other driver, with six victories in total. Ferrari have the most wins of the Spanish GP out of all of the teams, with a total of 11 wins. Kimi Räikkönen holds the current lap record with a 1:21.670 that he managed in 2008, according to the official Formula One website. 1991 : Ayrton Senna and Nigel Mansell raced the full length of the pit straight only two inches apart. Sparks flew from both cars at 300kph as Mansell squeezed ahead. 1994 : Michael Schumacher finished second, despite being stuck in fifth gear most of the race. He adjusted his driving style to accommodate for the broken gearbox. 1996 : Schumacher took his first win for Ferrari in awful conditions, at one point lapping four seconds per lap quicker than his rivals. 2001 : Mika Hakkinen looked set for an easy victory until the final lap when his clutch exploded. The McLaren crawled to a halt just five corners from the chequered flag.